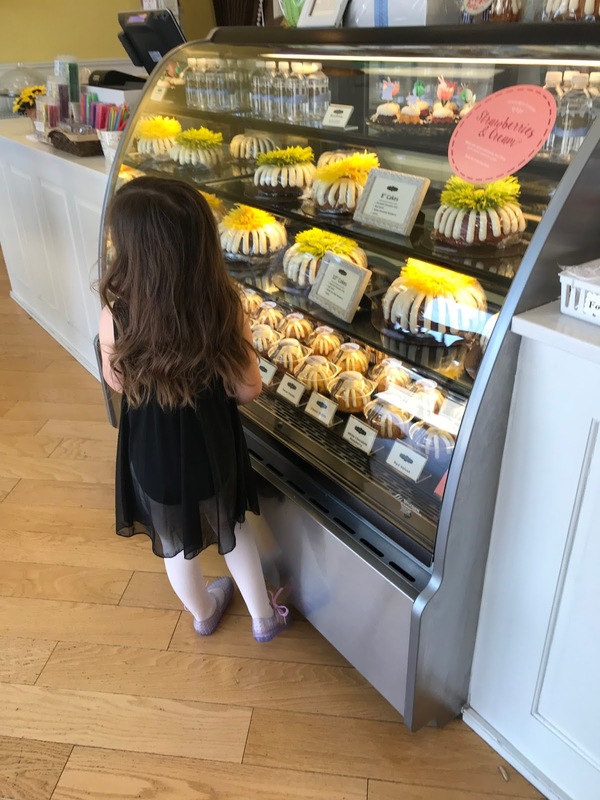 Friday morning was a toss up between doing absolutely nothing and lounging all day in our pajamas and taking the kids to the arboretum and ultimately the GORGEOUS forecast won out and we packed some snacks and made our way to Dallas. I am SO GLAD we did! It was perfect weather and the kids and I had the best time wandering, playing, smelling the flowers and just exploring. They're seriously at such fun ages. The tulips are on their last leg but were still so gorgeous! We stopped for a snack and stumbled upon a kids concert we didn't know was happening which was super fun. I have always had DREAMS of wisteria in my yard somewhere and this section of the arboretum sealed the deal for me. GORGEOUS!!! And y'all know I have a soft spot for tulips - they didn't disappoint! This girl is ALWAYS skipping, twirling, hopping, etc. You know how sometimes you snap a picture and realize later you just kind of accidentally got #allthethings right? That's how I felt when I downloaded pics that night. LOVE this pic!!! We swung through Sonic on our way home (I switch it up between Sprite Zero and diet strawberry limeade) for lunch because we needed to make a MAJOR grocery run and I knew that they needed full bellies to make it through. And yes... that's a full two carts... and no I didn't have to push either one (including the one with Griffin in the car in the front!) YAY for big boys helping!!! We unloaded groceries and then spent the rest of the afternoon playing outside. 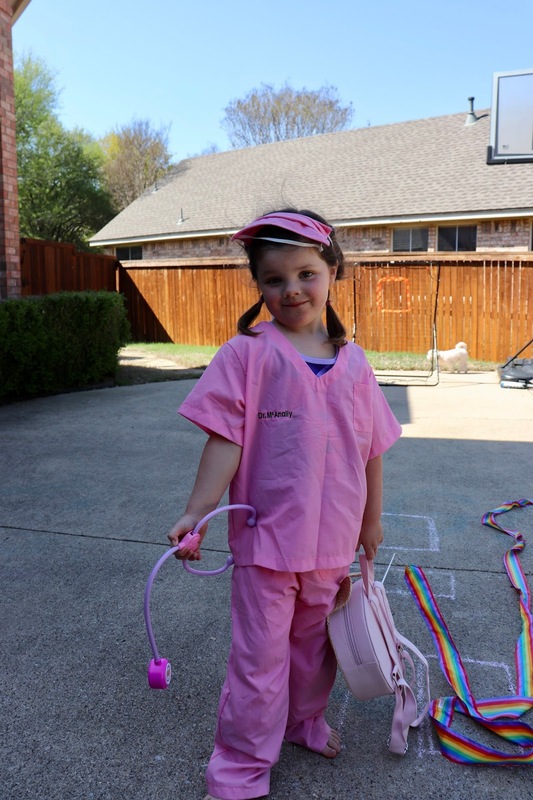 The boys rode bikes and Griffin opted to put on her scrubs and spread 45 little toys all over the driveway instead. I made dinners in the kids yumboxes and we headed to the ballfields and set up shop for Luke's game. Ring pop, overalls, ball cap, aviators and a ring pop. Doesn't get much better than that! Luke's team played hard and we always love watching him. We were WIPED after such a fun day and when we got home it was baths and Greatest Showman in my bed for everyone. Saturday morning we headed to The Ranch for egg hunting and while it was a bit windy and chilly that didn't stop the kids from having a blast. LOOT! And look at all the eggs still out there! Griffin decided that she wasn't afraid of the Easter Bunny this year and so we were able to grab a photo! EXCITING! ... and then Griffin and I were off to dance class followed by several Easter/birthday errands. 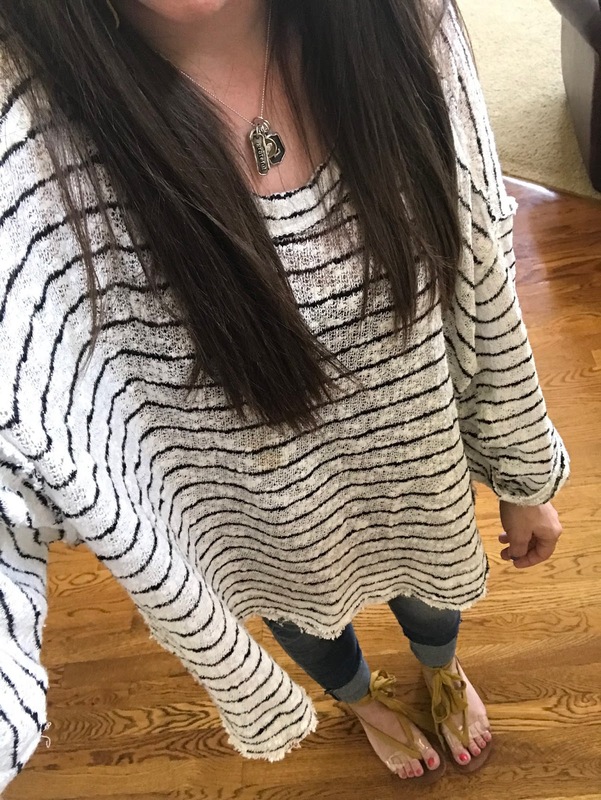 PS - my go-to weekend shirt is on sale for half off HERE! And my shoes aren't on sale but they are SO COMFY and you can find them HERE. 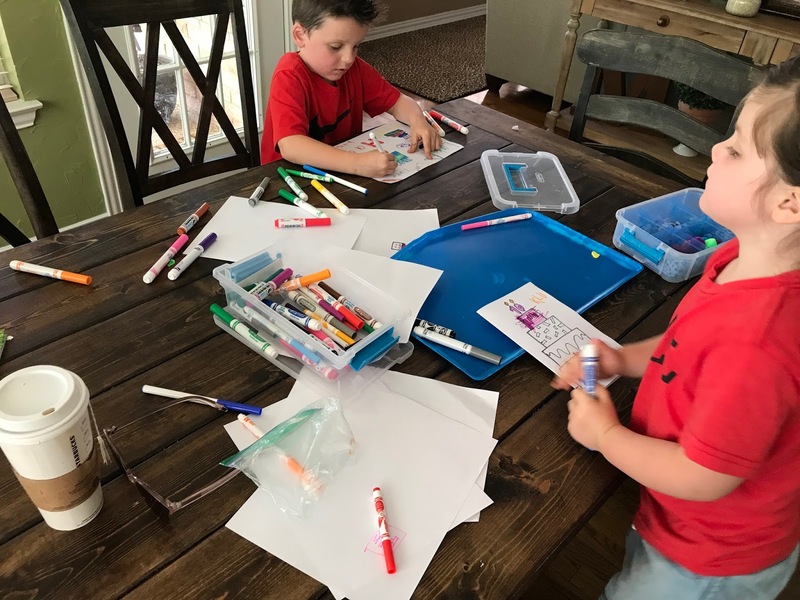 We spent the rest of the afternoon making birthday cards, cleaning the house, doing ALLLLLL the laundry and getting things ready for Easter and Luke's birthday. These pictures have me wanting to go to the Arboretum STAT!! And I’m not sure Griffin has ever channeled her inner-Andrea more than her overall, cap, and Birks outfit. She looks like your mini all the time, but in those pictures-SPOT ON!! Before I scrolled all the way down, I honestly thought that was a picture of Andrea that one of the kids took!! So cute!! You should dress alike one day, hair, hat and glasses too! The Easter Bunny dabbing made me laugh out loud. And Griffin in the overalls and trucker hat is everything. Oh my word! Give me all the sweet pics, Andrea! So cute! What a great start to your Easter weekend! How fun!! Griffins little dress and shoes at the Easter Egg Hunt are adorable. I just love her outfits, girlfriends got style!! !😘I agree she is a mini you. So many gorgeous pictures, thanks for sharing!!! 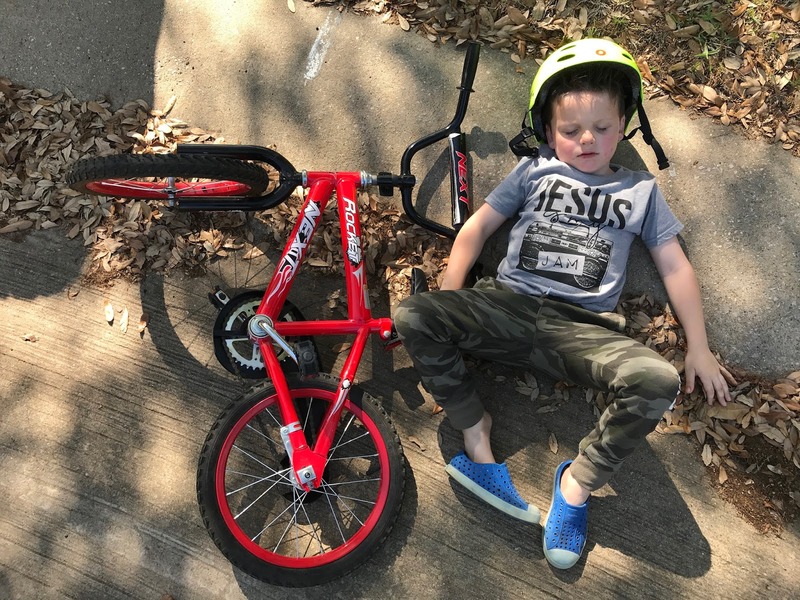 Please order a canvas of sweet Mason napping outside with his bike. Wasn't the Arboretum BEAUTIFUL!!! It was one of my favorite DFW outings so far! I can't wait to see all the birthday fun...I'm sure you are more than ready for a nap after this weekend. 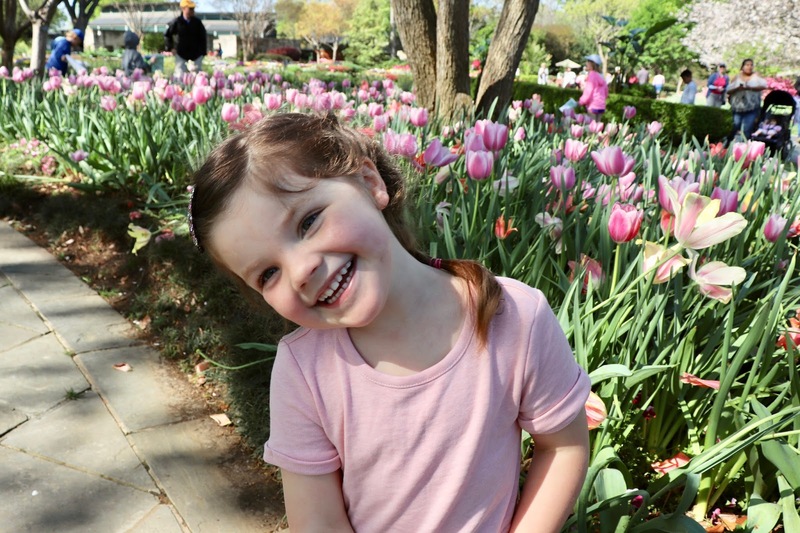 Beautiful pictures of the kids at the Arboretum! I need info on Griffin's outfits! She is...GOALS!! Beautiful family! GG's signature move is my favorite! Griffin's Easter dress is GORGEOUS! GG was IN STYLE this weekend! :) The bunny dress, so cute! And what a big girl she is to stand right beside that big Easter Bunny;) I love all the pics, thanks so much for sharing! Where are Griffin’s headbands from? Gosh. Griffin is just #goals in so many ways. She is too much sweetness. I love Griffin's overalls! Where are they from?